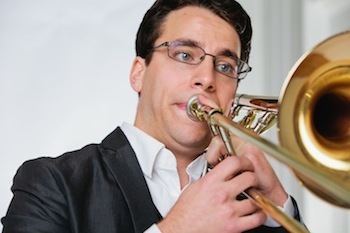 Caleb Lambert began his musical training at age eleven in Olympia, Washington where he studied euphonium and trombone with Syd Potter and Richard Lopez. In 2007 Mr. Lambert attended Roosevelt University in Chicago, Il where he studied with Jay Friedman and Peter Ellefson. In demand as an orchestral musician, Caleb is currently second trombone in Orchestra Iowa and served as the interim second trombone for the 2017-2018 season in Quad City Symphony. Mr. Lambert also performs frequently with the Dubuque Symphony Orchestra and Waterloo-Cedar Falls Symphony. As a freelance musician, he has had the honor to work with the Chicago Symphony, South Bend Symphony, the Civic Orchestra of Chicago, New Chicago Brass, and many others. Mr. Lambert was awarded the Grand Prize at the Chicago Brass Festival’s Solo Competition on euphonium in 2012 and can often be seen performing on euphonium and bass trumpet around the Midwest. During his tenure with the Axiom Brass Quintet Mr. Lambert was awarded the Preis der Europa-Stadt Passau and taught classes in chamber music and trombone pedagogy at some of America’s leading music conservatories including the Juilliard School of Music, Manhattan School of Music, Boston University, New England Conservatory, University of the Pacific, Southern Oregon University, University of Las Vegas, Western Illinois University, California State University, Sacramento and many more. In addition to his teaching duties at the University of Iowa where he is earning his Doctorate of Musical Arts, Mr. Lambert is a low brass teaching partner at West Music in Coralville, IA and runs a small private studio in Iowa City.